Atlanta returns tonight (March 1), meaning that its star/creator Donald Glover has been doing some increasingly rare press runs talking about what fans can expect in the show's second season. 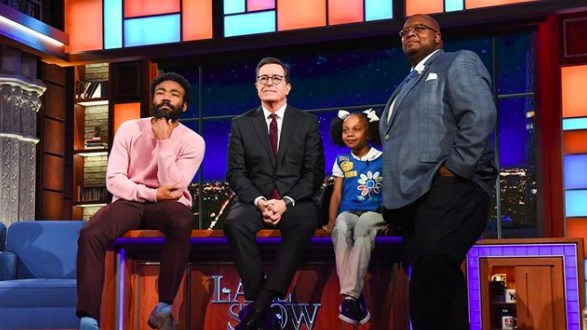 During an appearance on Stephen Colbert's Late Show on Wednesday (Feb. 28), Glover was introduced to Charity Joy, the Girl Scout from Atlanta who went viral with her cover of his track, "Redbone." Charity Joy's video, co-starring her father, turns the Childish Gambino classic into a promotional campaign to sell cookies. As it turns out, the video, in addition to being incredibly adorable, is also effective, leading the song's original creator to purchase no less than 113 boxes of Thin Mints on the spot. "They're vegan," Glover explained on Colbert's show. You have our full support with that purchase, Donald. For those interested in following in his footsteps, please see here for more information regarding how to find Girl Scouts selling cookies in your area. Atlanta returns tonight at 10pm on FX. Take a look at the precious moment, below, and be sure to see REVOLT TV's expectations for Atlanta: Robbin here. Interview | Snoop Dogg, Jessica Rothe, and Scout Durwood of "Mary + Jane"